Lina is THE perfect pattern to have some fun with fabric mixing. Whether you want to be bold and mix different patterns, solids or stripes or whether you decide to just play with some piping, Lina is a nice blank slate for a tee with a twist. Lina is a versatile pattern for a fitted girls shirt in vintage style. The bib, puff (or normal) sleeves and waistband create a very unique look. Both long and short sleeves as well as versions with and without waistband are included. 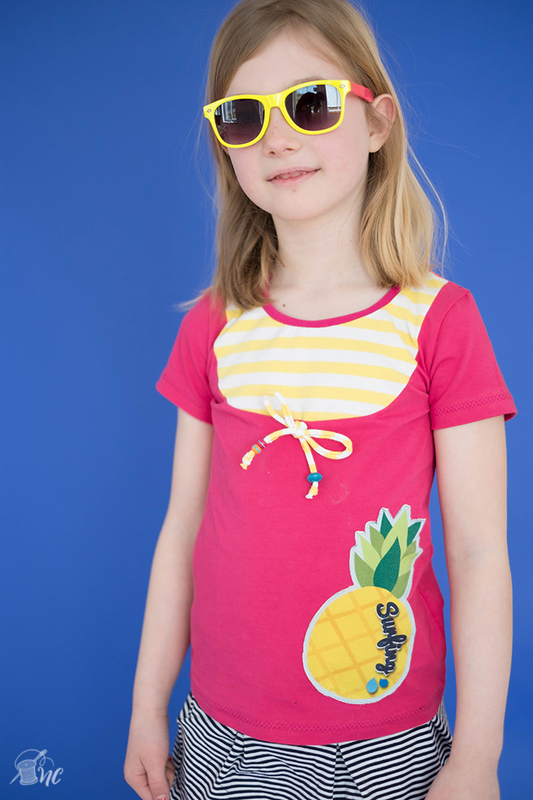 You can also sew the shirt without the bib resulting in a well-fitting basic tee. With this pattern the only limit is your imagination. Go wild, play with fabric combinations and trim and enjoy your sewing time. This pdf pattern contains instructions and the pattern for a shirt in european sizes 74/80 to 158/164 (with the numbers corresponding to height in cm). The pattern includes a detailed instructions (27 pages), recommendations on fabric and notions, fabric requirements and a finished garment measurement chart. The pattern itself is included in A4/letter format (print at home, 16 pages) . Please note that this purchase is for a pdf home sewing pattern of the “ Lina” (not the actual garment). Upon purchase you will receive an email to download the pattern.